E-Quip Blog: Fortifying Your Firm's "Strategic Foundations"
Does your firm have explicit core values? A purpose or mission statement? Can you identify the distinguishing features of your corporate culture? Do you have a compelling vision for the future? Does it really matter? Chances are you can answer yes to most or all of the above questions, although honesty may force you to hedge a bit on the last one. How many technical professionals would consider such matters as key to their firm's success? They might even be inclined to agree with the cartoon character Dilbert who once defined core values as "a type of emotional illusion common to children, idiots, and non-engineers." 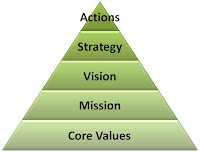 The lack of enthusiasm for core values, purpose statements, and vision statements is understandable. While most firms have articulated these, most don't really act on them. You might find them hanging on the wall or tucked away in a planning document, but you may be hard pressed to see them consistently expressed in the way the firm conducts business. So why bother? Perhaps it's because we know the best companies all have them. But having these things is hardly the point; living them is. And it's true that companies with strong cultures, shared values, a clear sense of purpose, and inspiring goals vastly outperform those that merely go through the motions. There is abundant proof that companies that build their businesses on these "strategic foundations" enjoy substantially better financial results. Probably the best known study in this area was conducted by Harvard Business School professors Kotter and Heskett, who tracked the performance of several companies over an 11-year period. The ones with "high performing cultures," as measured by the well-tested Organizational Culture Inventory (OCI), delivered remarkably better bottom-line outcomes: 4x higher revenues, 8x greater staff growth, 12x higher stock prices, and 700x better profit! Among the characteristics that Kotter and Heskett found in the top performing cultures were: strong shared values, high integrity, members who actively support each other, entrepreneurial drive, concerted effort to maintain the culture and pass it on to newcomers, and leadership that produces change. How many of those traits does your firm have? Honestly. Other academic studies and one recently completed by McKinsey & Company reached similar conclusions. Strong cultures--which are largely shaped by values, purpose, and vision--deliver tangible results that even the Dilberts in our midst can appreciate. So if by chance your firm hasn't taken the steps to define your strategic foundations, let me urge you to do so. It's not fluff, not merely an academic or philosophical exercise. It's practical wisdom. And in this economy, can you afford to ignore what has worked for hundreds of the best-performing companies? For the majority of firms that have at least identified their values, purpose, and vision, the operative question--to be blunt--is: So what? Has it really made a difference in how you operate? Is it "top of mind" in your external and internal interactions, decision making, standard practices, and policies? If not, or if you think you could do better, let me recommend putting your foundations to the test. One suggestion: I recently worked with a firm where we conducted a virtual "cultural archeological dig" exercise. Participants imagined themselves as outside observers, looking for manifestations of their firm's true culture and values. The basic premise of this exercise is that your firm's culture and values are not what you espouse them to be, but what is expressed in tangible, observable ways. Such an exercise can deliver some surprising results. For example, this firm found lacking solid proof of their formal values. A recent client survey, for example, produced middling scores for two of their values--"quality" and "creativity." While the overall scores for service were good, the group decided they weren't good enough to merit another of their values: "superior service." They found other evidence that one of their purported strengths, their distinctive culture, was eroding in the face of rapid growth and organizational changes. Is our culture the product of intentional design and effort? Can our employees describe its distinctive attributes? Do we measure, or at least informally track, certain important aspects of our culture? Is cultural fit a key criterion in our hiring decisions? Do we have a process for integrating new employees into our culture? Have we been deliberate in establishing key dimensions of our culture in branch offices? Do we routinely reference our values in all aspects of our business? Do all our employees know what our values are? Do we tolerate the deliberate violation of our values? Are there consequences? Do we have any standard practices, policies, or structures that are not consistent with our values? Is our purpose statement brief, memorable, and compelling? Are all our employees familiar with it? Do they find it inspiring? Does it capture the essence of why our firm exists? Is it evident in our operational priorities? Does it both support growth and constrain our choices? Do we find this exciting? Does it guide our strategy? Is it clear, compelling, and easy to remember? Does it connect to our core purpose? Is it a stretch but still achievable? Will we know when we've achieved it? Is it measurable in some way? These are a few questions to get you started. The important things to look for are (1) authenticity and (2) impact. If you find either of these qualities lacking, it's time to rethink your strategic foundations. Perhaps you need to better align your business practices with what you espouse. Or perhaps you need to ask: Who are we really? What does the evidence suggest? Maybe your strategic foundations need to arise from there. Take a closer look. You might be surprised what you find, like my client. But whether you discover something new or simply confirm what you thought, you'll be wiser for getting to know your firm better.